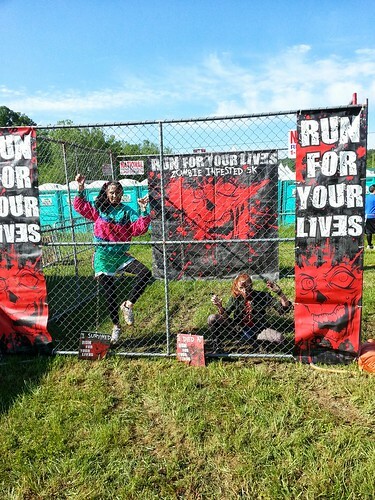 Jonah and I did the 2013 Run For Your Lives zombie-infested 5K obstacle course. As with last year’s event, it was a great time. The zombie make-up was terrific, the mood of all the participants was great, and the event was, on the whole, well executed. Registration was quick and painless, as there were plenty of check-in stations open to keep things moving quickly. A security bag inspection was a minor bottleneck. As with last year, there was a bag check tent, in which participants could store their gear. Unlike last year, all of your gear was required to fit in one comparatively small clear ziplock bag, which they furnished to you. Jonah and I had to hike back to the car to drop off our change of clothes and sundry other items we had planned to check. Then we hiked back to the bag check tent and stuffed our towels into the little bags. The main area of the event was considerably smaller this year. 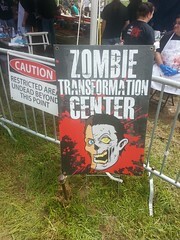 There was a concession stand, a merchandise booth, and the Zombie Transformation Center. I don’t remember seeing this tent last year, but maybe I simply missed it. 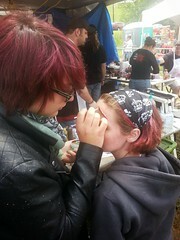 It was a lot of fun to watch the make-up artists apply their craft to the would-be zombies. Everyone seemed to be really enjoying themselves. Race heats started at 8 AM. The heat for which we were registered was 10:30 AM, and it left right on time. As soon as we were out the gate, I knew this was going to be an even more grueling experience than last year’s. When I “trained” for this event, it was at a pretty steady pace around my neighborhood. Unfortunately, simply jogging past most of the zombies isn’t a viable strategy: you need to sprint and dodge. This, by itself, wears you down much quicker than a simple jog, and wasn’t an activity I had really practiced. But the biggest challenge to the 2013 event was the terrain. We were in the Hocking Hills region of Logan county, and the hills were absolutely brutal. The very first thing we had to do once we left the starting area was to climb a steep hill. Some brave souls actually jogged up, but most of us tried to conserve our energy by walking up. Without exception, everyone was winded once they reached the top. And of course at the top was the first horde of zombies through which we had to run! The hills proved far more taxing than I had anticipated, and I ended up walking most of the course. I joked with the folks around me that the event was better called “Walk Briskly For Your Lives,” which proved fairly accurate for most of us. 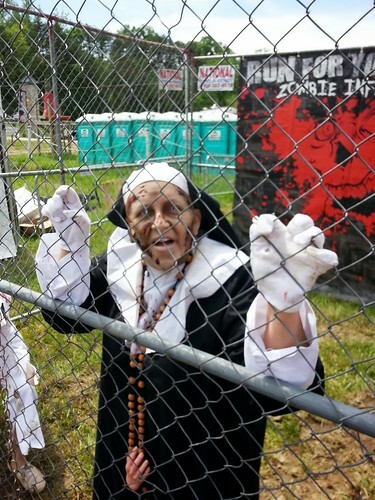 Most of the obstacles were the same from last year: a smoke-filled barn in which electrically-charged wires hung down in our path; hurdles we had to climb over or under; a simple maze; and of course lots and lots of zombies. 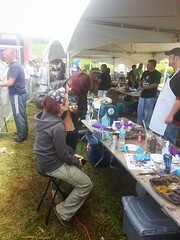 Unlike last year, none of the obstacles were bottlenecks for the participants, which was great for all of us. Last year, several of the obstacles were a real impediment, and folks were lined up for several minutes as they waited their turn. This year, there were no such lines and the whole event felt much faster (“faster” being a relative term, since it still took me almost an hour to complete the course!). The race wasn’t timed this year. Instead, it was simply pass / fail: if you finished the course with at least one flag left on your belt then you were a survivor. If you had no flags when you crossed the finish line, you were a victim. I lost all three of my flags somewhere shortly after the first mile. For victims like me, there were a few opportunities to gain a replacement flag, which I greedily snapped up. Of course, the first zombie I saw after I gained my bonus health flag took it away. Jonah, unsurprisingly, finished the course well ahead of me. As I approached the final obstacle he was there to greet me. He informed me that he finished with three flags! I asked him for one, which he helpfully tossed over to me, allowing me to finish the race as a survivor. I can now honestly declare that Jonah has saved my life. I recorded the whole race in order to share the experience with friends and family. Large portions of the video were boring views of me walking up and down hills, so I edited many of those out. The video above should represent some of the highlights of the obstacles and zombies. Even highly edited, it still clocks in at 30 minutes and probably has more boring walking bits than is necessary. Even though I walked most of the course, RFYL 2013 was a lot of fun. I hope to be able to do it again next year. I might even take a stab at being a zombie next year, too.